Id selector is one of the most used jQuery selectors and used to select just one specific element from a page. For example, $("#main") will return the HTML element with id as main. just like CSS, you need to use # (hash) to select element with their IDs. It's also the fastest selector and if you can use then always prefer ID selector. They are also very popular in jQuery interviews and you will always see one more two questions from ID selector. // Select HTML element with id as main e.g. div id="main"
// Select HTML element with id as guess_box e.g. div id="guess_box"
The class selector is another most common jQuery selector and used to select a group of elements from HTML page. If you remember, the class is used to style elements in jQuery but it can also use to group related elements together in jQuery even if they don't have any style. Just like in CSS, a class selector is started with a . (dot) e.g. $(".active") will return all elements from page which has class="active". If you remember the $() is a shortcut of jQuery() method and if you use jQuery you may get the error like "Uncaught ReferenceError: $ is not defined" if the browser is not able to load the jQuery properly. The jQuery tag selector, also known as element selector selects all the specified element from the HTML page. For example, $("p") will select all paragraphs and $("div") will select all divs. Internally tag selector calls the getElementsByTagName() function to return the appropriate elements from DOM. The descendant selector selects all elements that are descendants of a given ancestor. The format of this selector is $(ancestor descendant) where ancestor is any valid selector and descendant is a valid selector to filter descendant elements. For example, $( "form input" ) will return any input which are descendant of form element i.e. they are inside any form. See Head First jQuery to learn more about advanced selector in jQuery. The child selector is similar to descendant selector but it only return the direct child. It has format of $(parent > child) , for example $("div > span") will return all span which are direct child of div elements. The :even, :odd, :checked are examples of pseudo selectors, they are not part of CSS specification but extension of jQuery to provide convenience e.g. you can use :even to select even elements (zero indexed) e.g. even rows in table to style them differently. Similarly, :odd can be used to select :odd elements in DOM tree and :checked can be used to find check elements e.g. checked radio buttons or check boxes. See jQuery in Action to learn more how pseudo selector works in jQuery. The multiple selector is nothing but combining more than one selector in single search e.g. $(selector1, selector2, selector3) is a multiple selector which selects the combined results of all the specified selectors. For example, $( "div, span, p" ) will select all div, span, and p elements from the DOM. Remember, individual selectors are separated by comma. The all or universal selector is used to select all elements e.g. $(*) will select all elements from HTML page. This is useful when you want to apply a style to all elements of HTML page. Btw, just be careful The all, or universal, selector is extremely slow, except when used by itself. The :has() selector selects all elements that have one or more elements inside of them, that matches the specified selector. For example $("b:has(h1)") will select all <b> elements than have <h1> element inside of them. 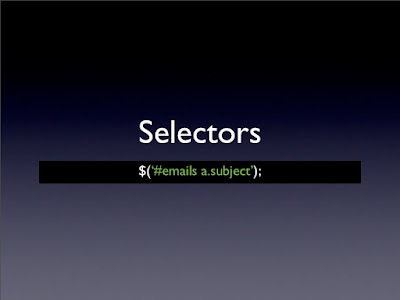 That's all about 10 examples of jQuery selectors for web developers. I am sure you have learned a couple of new things today. Though most of them times you would find yourself using just class and id selector, knowing different types of selector will help you to use jQuery more effectively. 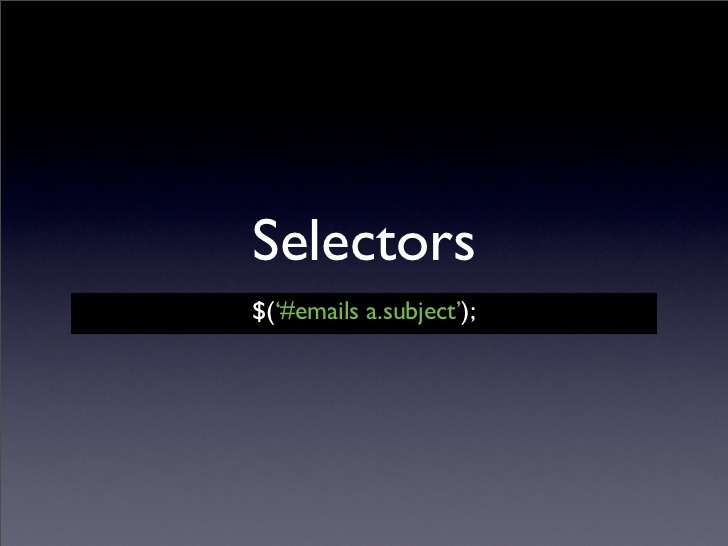 Always remember to use the most specific selector to gain the best performance from jQuery. For example, using input[type=radio]:checked is more specific than just using :radio :checked.